Ever wondered if the moon is really made of cheese? Why does it change shape and size during the month? Many Moons is the perfect book to show and explain the different phases of the moon. Watch your kids start to understand the difference between a waxing or waning moon! 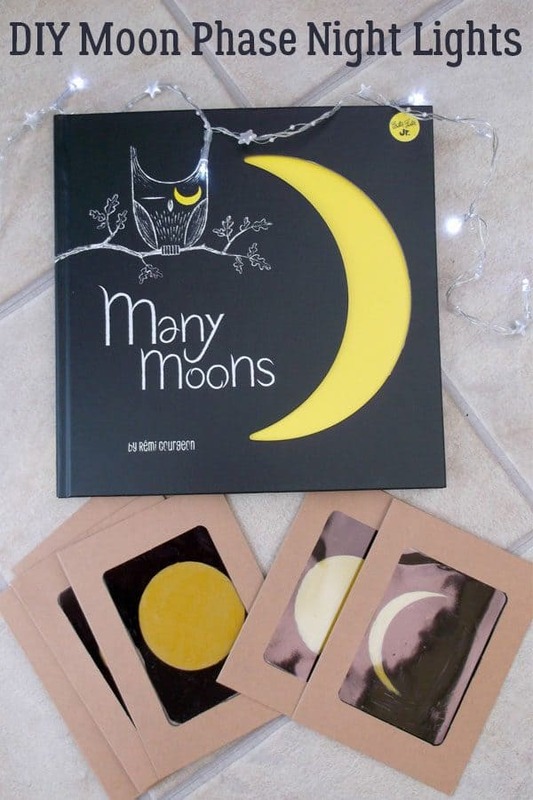 Many Moons by Remi Courgen, shows children how to look at the phases of the moon by comparing the shapes with things they will know and recognise. A wonderful book that is beautifully written and has striking black, white and yellow illustrations. Many Moons by Remi Courgen can be purchased via our affiliate link on Amazon. More Space and Moon books for you and your Kids to read together. 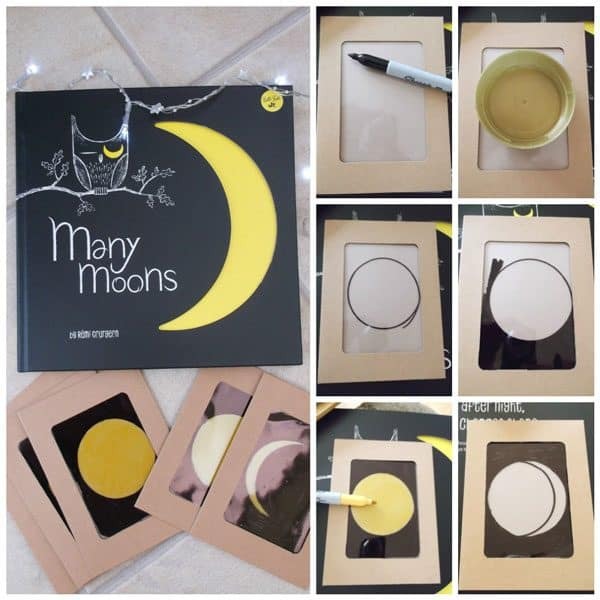 I really enjoyed reading this book and it inspired me to make a simple night light to show my child how to track the phases of the moon! This seemed an ideal craft to share with you as part of the Storybook Summer Series on Rainy Day Mum! Take the coin and put it in the centre of the plastic on the window envelope. Draw around it with a marker and do this on every envelope. 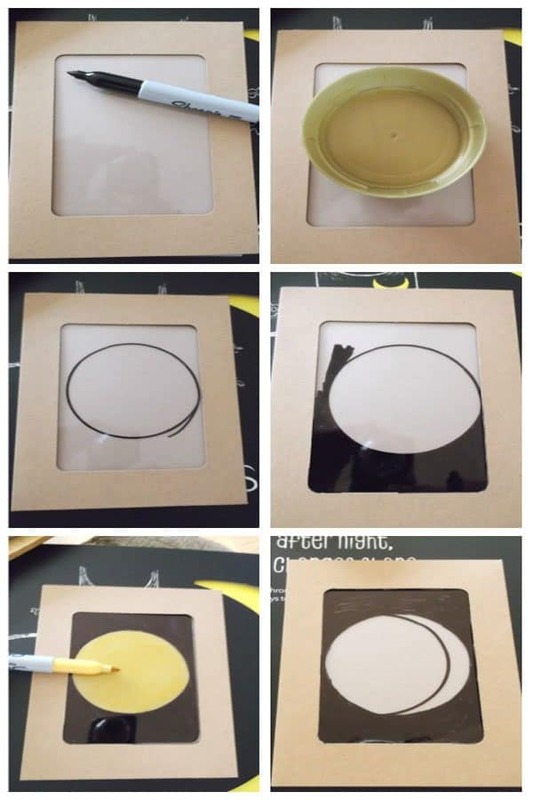 Then, colour the outside of the circle with the black marker or glue some black tissue paper onto the plastic. Next, look in the back of the book Many Moons (or look online) for the different phases of the moon. Take the coin and place over the circle and draw another line around it to show a crescent moon. Fill in the crescent with yellow marker or tissue paper and colour in the rest of the shape with the black marker. Repeat this on the rest of the window envelopes to show a new moon, crescent moon, waxing and waning moon phases and a full moon. Once the envelopes are dry put them in moon phase order. Next, take the led fairy lights and place one in each of the envelopes. Secure these onto each light with the small pegs. Finally, hang the string of lights up and switch them on to see the all the phases of the moon lit up! 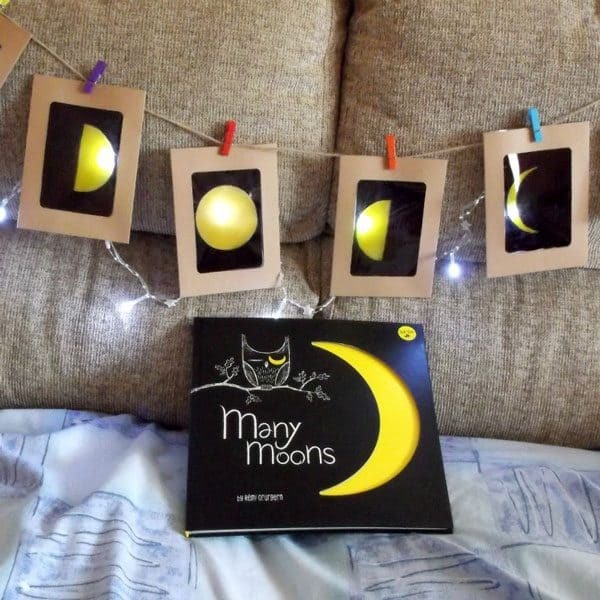 We really enjoyed making these simple Moon Phase Night Lights and we love having them switched on in the evening. 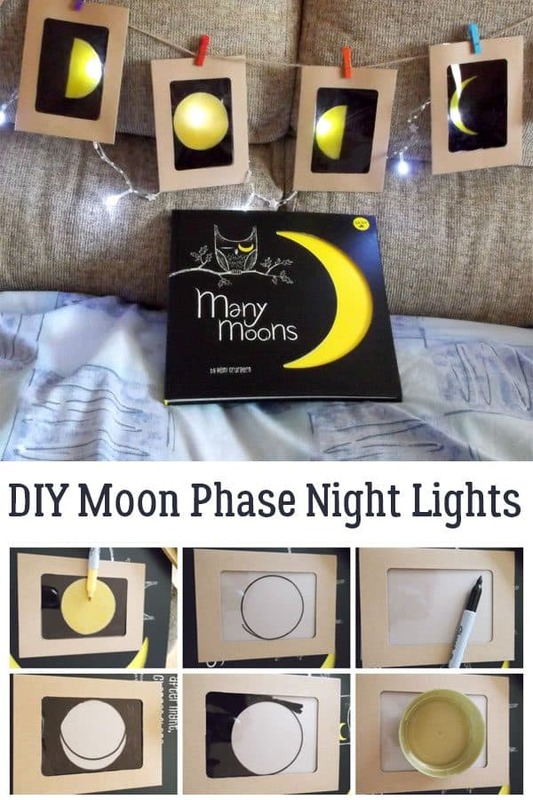 They are a great way of seeing the moon phase sequence and are not only make an awesome night light but they are a great learning tool as well. Helen Newberry runs CrArty which is dedicated to the arts and crafts. 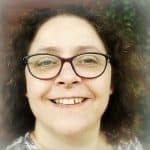 She is a published author, art historian, teacher and business woman. CrArty Kids has developed into a whole section of CrArty which is dedicated to learning about art and crafts. The focus is on developing artistic, creative and practical craft skills for the younger members of the family.